The recent Robert Downey, Jr. feature film is the latest screen incarnation of the iconic detective Sherlock Holmes. 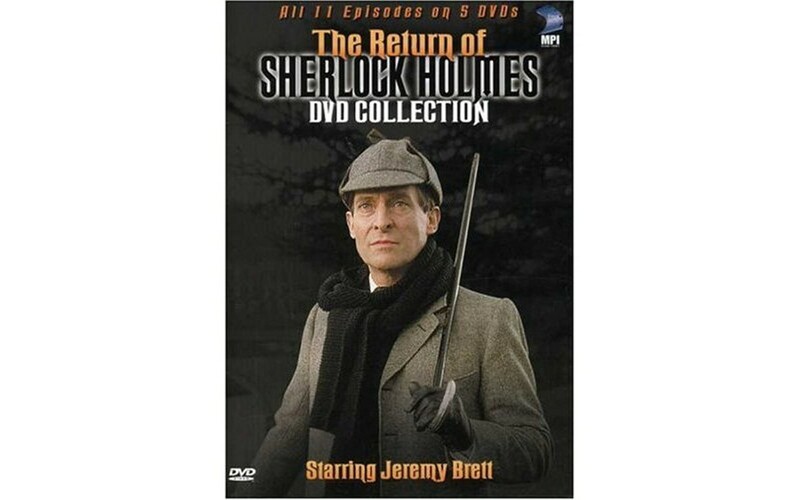 But the definitive portrayal is arguably still Jeremy Brett's, in the British television series of 41 Holmes stories made over a decade, ending in 1994. The remastered versions in the DVD series reveal much more than the butchered television versions seen in the U.S. The 11 episodes in The Return of Sherlock Holmes set may be the best of all. These are some of the best stories with the best director, and a better Watson (Edward Hardwicke). But they are special for showcasing Jeremy Brett at the incandescent height of his portrayal. Though the Downey movie as well as other screen incarnations invented new plots for the Holmes character, this series worked only from the original Arthur Conan Doyle stories. At a certain point Conan Doyle got sick of writing about Holmes and killed the character off, but he brought him back due to popular demand. That's where The Return of Sherlock Holmes series begins. DVD extras emphasize how deeply Brett delved into the stories and the character, and how relentless were his efforts to use the TV medium and make the best possible films to serve them. It became his obsession. Brett created an intense and mercurial Holmes, his sudden stillness exploding in quick motion and flamboyant gestures. He felt his interpretation accurately reflected the written character, but he also realized it matched his own personality: So much so that in the course of this series, Brett had to seek treatment for manic depression. Lithium changed his physical appearance, and his face got puffier, wan and more haunting. These episodes begin to reflect the changes, but mainly represent the high point of his riveting, mesmerizing Holmes. Just a year after filming his last Holmes story, Jeremy Brett died, basically from heart problems that began with a childhood bout of rheumatic fever, though overwork on the series probably contributed to shortening his life. Did his dedication to the Holmes role make his manic depression worse, or did he heroically turn that illness into something creative? Was his extraordinary identification with the role wholly tragic, or perhaps a little to be envied? The opportunity to play an iconic role in a lasting form comes to few. In the end, it seems to me that his tragedy is not so bad as more ordinary tragedies, of lives unfulfilled. An often excellent, iconic series of 41 televised stories -- of intriguing and entertaining if hardly profound popular art -- may not be the greatest accomplishment, but it is a great one. Is it worth a life? I think so -- that is: I think I'd take that bargain.